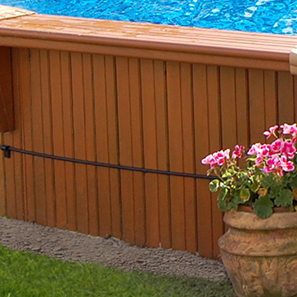 Aqua-Wood pools is committed to produce a high-end product that will bring you full satisfaction. In order to offer you a sturdy and durable product, Aqua-Wood ensures the quality of each component of its products. Our expertise guarantees the highest quality product. The cost of replacement will be the retail cost suggested by the manufacturer at the time of replacement. Note: Springing and graying of wood are natural phenomena caused by seasoning and ultraviolet rays. Applying a water-repellent stain greatly reduces these effects.Aqua-Wood reserves the right to change or improve the design of the product warranted hereunder without incurring any obligation to make any modifications to or to install any improvement on the product. The initial buyer and cannot be transferred. all problems due to animals, plants, blunt instruments or caused by vandalism. to provide proof of the original date of purchase by means of a bill of sale or contract. Do you have additional questions about pool winterizing or other topics regarding Aqua-Wood pools? Our FAQ is a useful resource!